The color. The vibe. The rhythm. The sight of culture embaraces all the color in all aspect. The beat of indie and disco swims all around you ear. 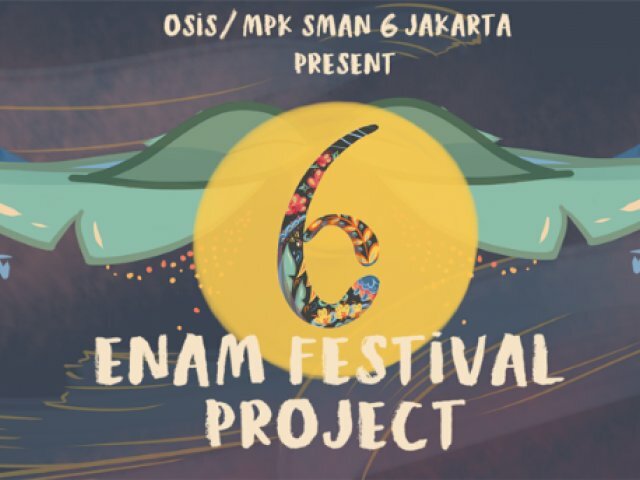 SMAN 6 JAKARTA STUDENT proudly present ENAM FESTIVAL PROJECT (ENTIPRO) 2018. Gather on our stage and enjoy the performances by IRAMAMAMA, NADIN AMIZAH, SENAR SENJA, and SILAMPUKAU. Don't forgot to see the excitement performance by SAMANHAKAM, SIXERS, BLUESGIL, THRILLIN, and MODERN DANCE by MAHAKAM 2K16!